US second quarter advanced GDP: It gave us an overall reading on the US economy and thus potentially influenced the timing and amount of the coming US rate hike. It came in worse than expected, lowering hopes for a June rate hike and thus causing a drop in the USD from which the dollar has only partially recovered as of early Thursday GMT. The FOMC statement: This gave us the latest clues about the Fed’s view of the US economy and thus the likely date of the first rate hike. As we predicted at the end of yesterday’s post, [link] the Fed’s outlook remains fundamentally unchanged. It believes that, just as this time last year, the recent early year weak data is just temporary “noise,” reflecting brief one-time events like the West Coast port strike. No change in market outlook on the coming Fed rate hike timing. The USD recovered some of its earlier losses from the poor advanced GDP reading, because was bullish news for the dollar. Few really expect US interest rates to rise in June, (most believe it’s coming sometime from September to December), but the Fed didn’t rule out that possibility either. Given Thursday’s lack of market moving events of a similar magnitude, how to trade the USD in the days ahead remains the big story, so we MUST follow up on our April 29 article on trading the market reaction to Wednesday’s big news with this one on trading the continuing reaction in the coming days for some of the major pairs like the EURUSD, USDJPY, USDGBP, and USDCHF. USD/JPY will most likely remain confined between 118 and 120 but for EUR/USD that means, 1.13 to 1.08 and for GBP/USD 1.52 and 1.55 before the U.K. election. The best way to trade the dollar post FOMC is to trade these ranges before NFPs. 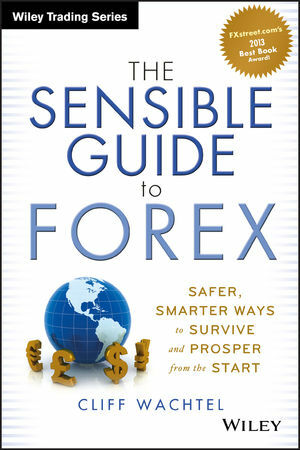 While the GDP report was bad for the USD, and the FOMC statement hurt hopes for a June rate hike, the Fed clearly has not changed its policy, therefore we expect the USD and its major pairs to remain in a flat trading range until at least Friday, possibly all the way into next week until coming key reports Friday and beyond start forming market expectations about the next big USD report, next Friday’s monthly US jobs reports. So buying near the bottom of these ranges and selling near their upper limits is the safe way to go. 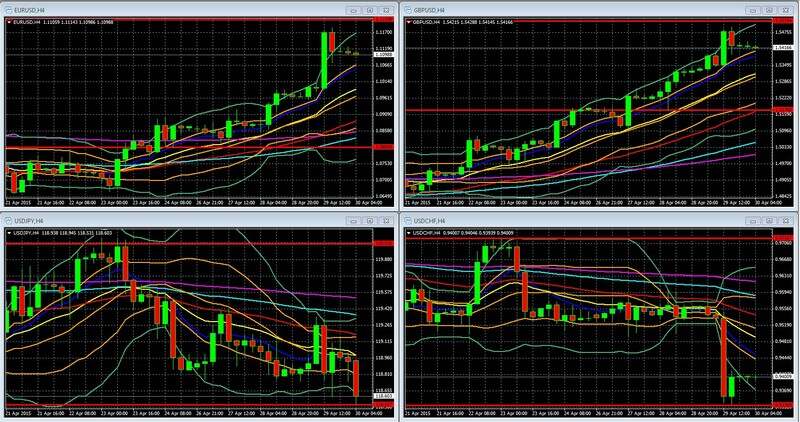 Here are the likely trading ranges over the next 24-48 hours (in red in the charts below). KEY:40 HOUR EMA DARK BLUE, 80 HOUR EMA YELLOW, 200 HOUR EMA RED, 400 HOUR EMA LIGHT BLUE, 800 HOUR EMA VIOLET, DOUBLE BOLLINGER BANDS NORMAL 2 STANDARD DEVIATIONS GREEN, 1 STANDARD DEVIATION ORANGE. As always, we recommend entering your stop losses and profit taking points in advance. That way you are forced to plan your entries and exits in advance, and thus remove the fear/greed emotions from your entry and exit decisions. When trading a range, try to trade in the direction of the trend, if there is one. That is, be very careful about opening short position (sell high buy back at lower price) if the pair is in an uptrend, or opening long positions (buy at lower price, sell at higher price) if the pair is in a downtrend. Otherwise with each passing hour the trend brings your stop loss, and a losing trade, closer. We want to place stop losses because Friday contains a number of events that could cause breakouts from these ranges, if they are much better or worse than expected. It happens. China: Manufacturing and services PMI: Major data points from China are market moving given the size of China’s economy. US: ISM manufacturing PMI: This is the first major report that hints at the likely results of the big US monthly jobs reports next Friday. In particular, watch the jobs portion of this report to see how factory jobs are doing. UK: Manufacturing PMI: Is a major indication of the UK’s economic health. In our April 28 article on gold we wrote that we’d follow up with a post on silver. The recent big USD data pushed the USD to the top of our trade opportunity list, and we correctly believed that precious metals would stay in minor trading ranges to digest their big gains Monday. Side note: the reason for that spike came out later. The cause was a long-anticipated Venezuela gold sale. That removed a big threat to precious metal prices, thus the sudden price increase.